I am often inspired by Swedish homes and their simplicity. (Though frequently I may not be simple.) 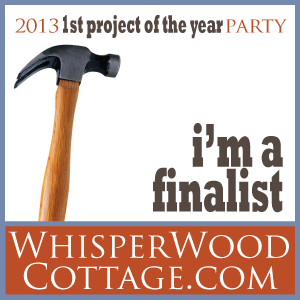 Even though it is a couple of weeks away, I am sharing it now, because I am working on other things. 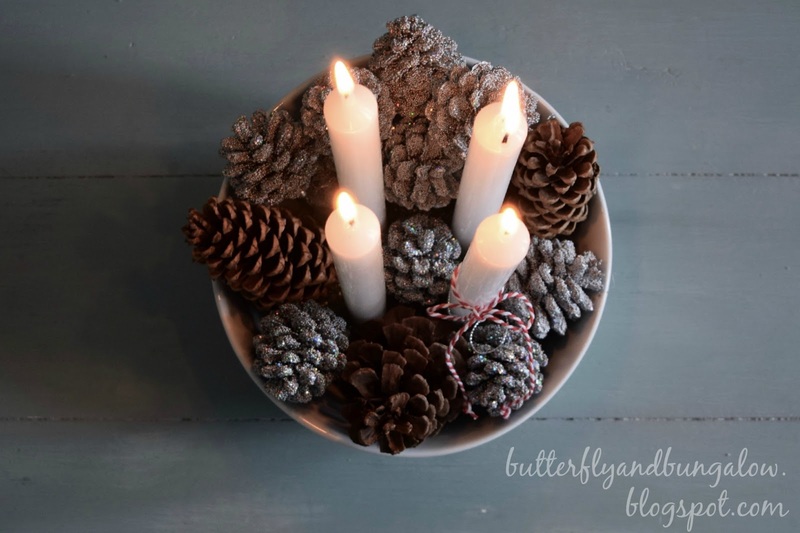 This is a simple advent "wreath". I bought pinecones, because we don't have pinecones here. I normally would have candles, but I left them out of the refrigerator in the potting shed, so they melted in the summer. First, I cut a piece of floral foam to the size that would fit nicely in the bowl. Then I decided where the holes would go on the foam so there would be enough space to fit a pinecone in the middle. Then I pushed the candles into the foam carefully, so as not to break them, and then removed them. Next, I used my hot glue gun to put a nickel sized dot at the bottom of the bowl to secure foam. Then I put hot glue in the holes and placed the four candles. My daughter than placed fifteen pinecones of various sizes to cover the foam; so, the number of pinecones depends on the size of the pinecones and the size of the bowl. Then we tied a piece of twine around the third week's candle. I think this could be done to make a menorah in a different shaped dish, though I might use something other than menorah candles, because they melt really fast and are very short by the last day. I also think it could be done colorfully or traditionally. I love Nordic Christmas decor too. There is something so wonderful about them. It's very pretty! I love the simple yet elegant look. It Looks so pretty, I like it. This is so pretty. It's always enlightening to remember that something so simple can be elegant. 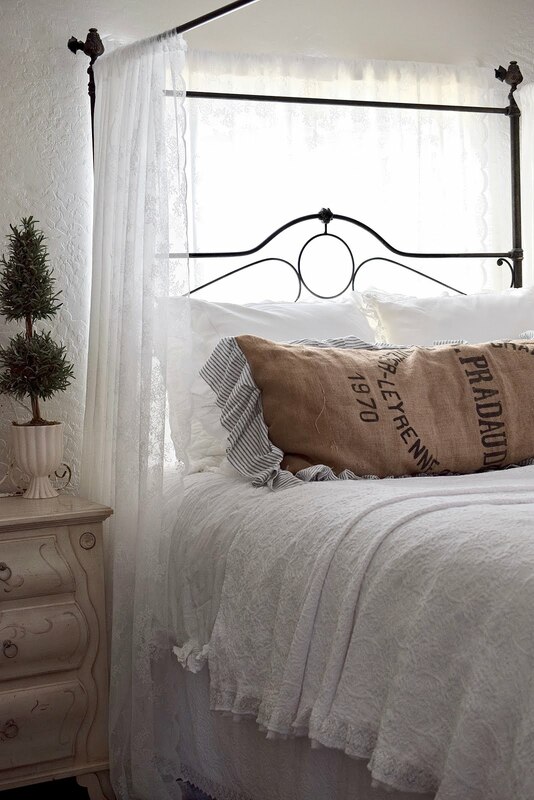 Hello Su you are speaking to me ... Rustic elegance with Nordic flare. I'm into simple and this is it. I spy - Loving the blue metal book trolley with wheels! That is very pretty! I love the sparkly ones!! 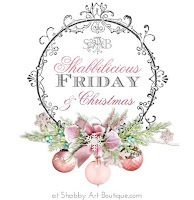 Simple designs are so classic and lovely - great ideas! I love pinecones too. Add some glitter as you have, and they are even prettier! Love your idea! I love it! Simple and elegant...nothing better. I almost bought two big white pinecones at a craft fair this weekend. They were so pretty, but I wasn't sure what to do with them. So lovely!! This would be a beautiful simple centerpiece for a round dining table! It is lovely! The simple things are the best. I love the Nordic blogs and last winter pinned simple things as it seems like what I've done in the past is too much, too busy. Advent devotions with our children when they were growing up are some of my best Christmas memories. The day after Thanksgiving instead of going to the mall we went to the florist and bought purple and pink heather and came home to make our advent wreath. Such good memories of those days and I hope they think so too. Love the simplicity of this...very nice. I am going for a simple theme this year and this is so pretty. 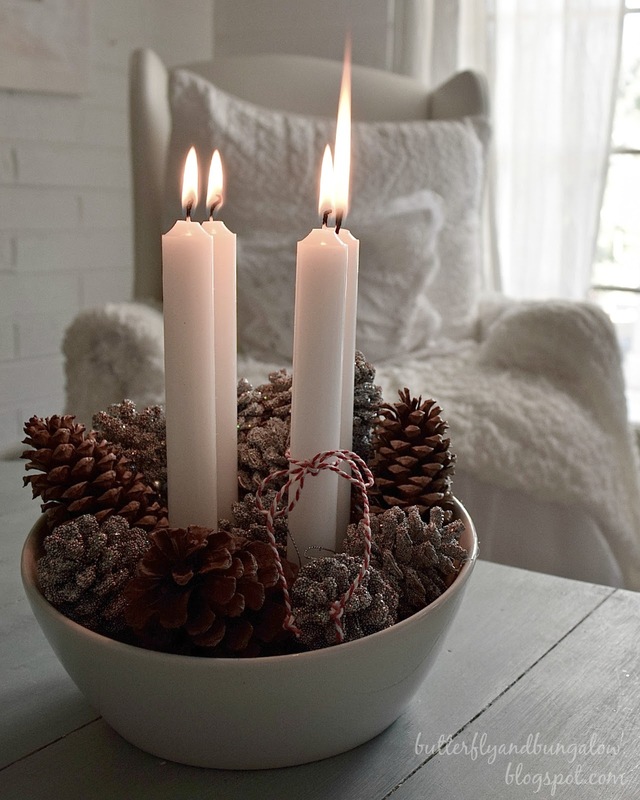 Love the pinecone with the white candles. So pretty. This is just beautiful. Thanks for sharing how you put it together. I love how simple and elegant the candles and pine cones look in the bowl! T F S! This is so beautiful and it coordinates perfectly with your home decor. I think the scented pine cones would be lovely in this wreath as well. I'm super afraid of lit candles in the house so I always go with flameless ones. Such simple elegance and beauty Su. I really love the idea. Easy and inexpensive. I really like this idea. I like simple and elegant. I have really changed my way of decorating to be simple and I use a lot of nature. 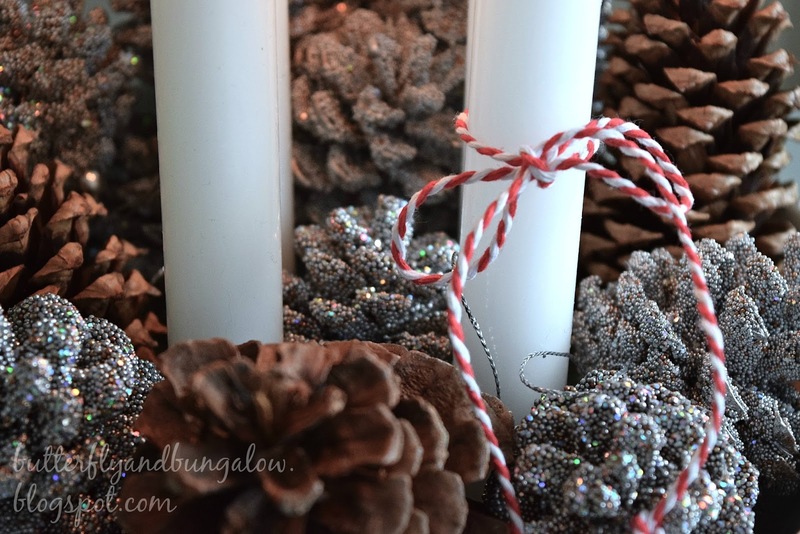 I love Nordic Christmas decor. That turned out so pretty! I wish I could have candles but I'm afraid the critters would burn the house down! I love your advent wreath. So simple and pretty. Sometimes simple is best! 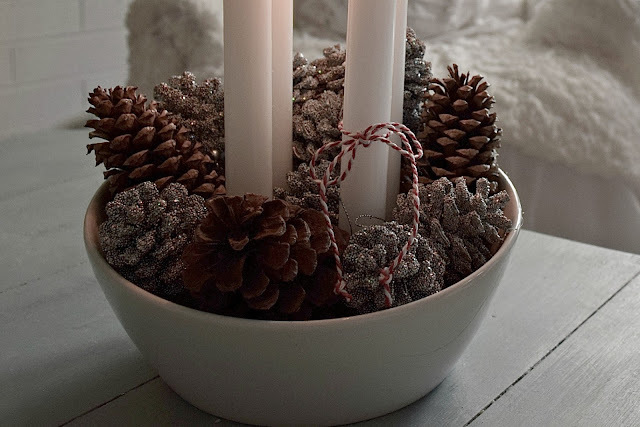 Love the pine cones surrounded by candles. I occasionally use real candles, but mostly flameless ones to be safe. I like this! So simple and clean and elegant. Great idea to put a spot of glue in the holes to keep those candles from tipping! I'm going to use that idea this year. I'll use my traditional Advent wreath and also this one. Love it! Yes Su, I too am drawn to a Nordic feel, this is the direction I want to go I. 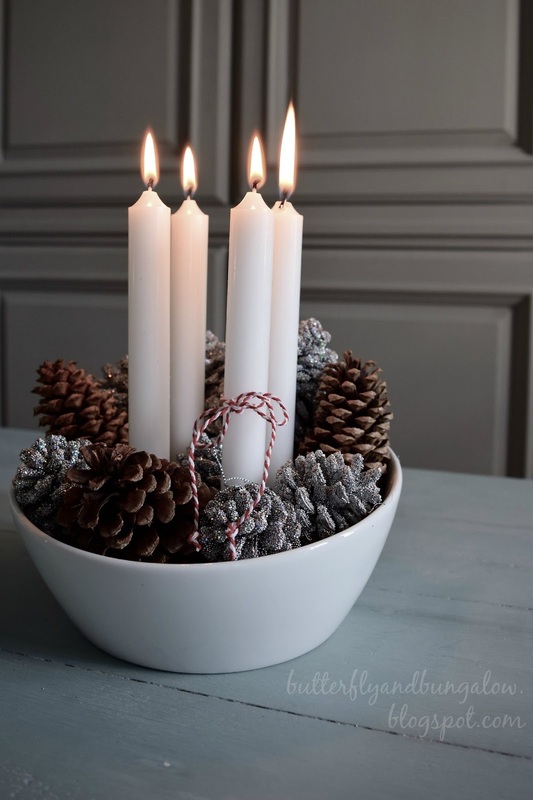 With my tree if I can find the right one, you pine cone candle holder bowl looks just like JDA and would appear in their magazine without a doubt. I have to mention the chair and the library cart, I love that cart you could do a whole post on that piece. See you soon dear and all that you are creating. Keep inspiring your Swedish look, we love it too! Thank you, Dore. I just picked up my magazine yesterday, and I am enjoying it. There is one shop that I know of that carries it, and I visit it once a month to pick it up. very beautiful. This simplicity is in the end just timeless. Very pretty. Love the touch of the baker's twine! I too love the simplicity of the Swedish homes and I love seeing the advent candles on Instagram. Thank you, Carol. It would look pretty in colors too. Such a pretty accent for a tabletop! 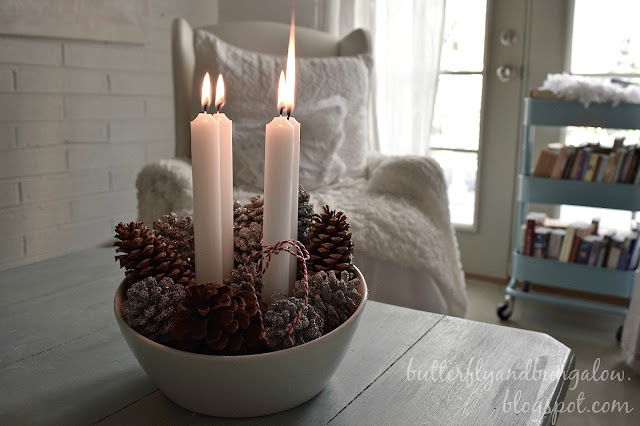 I'm trying to simplify my Christmas decor, and the Scandinavian look really appeals to me too. Thank you, Vickie. Happy Thanksgiving! It looks so beautiful !! I love these decorations !! BEAUTIFUL ... Elegant and just the perfect tough for your home. I love the simplicity of it. It looks rustic and pure. So sweet....I love it! I might try to make one like yours rather than the huge aden wreaths we make at church every year. I like yours better, and it would be much easier on our allergies! So pretty and perfect, Su. I love the clean, natural look of it. 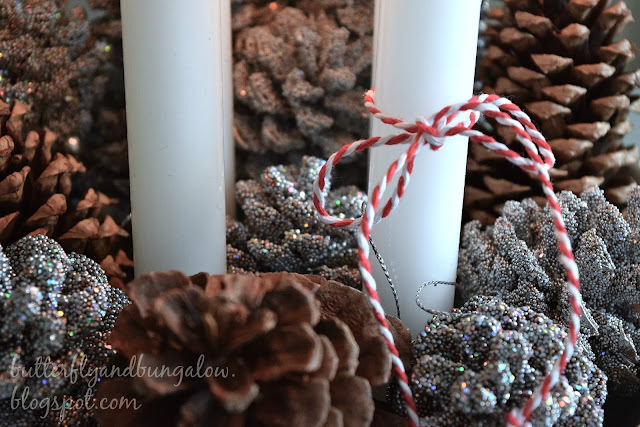 I love Scandinavian decorating Su and your advent candles look so lovely. 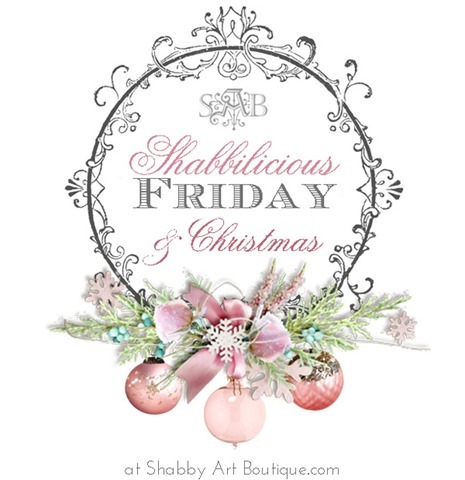 I've just featured them on my Sunday Features post at Shabby Art Boutique. Love it! Scandinavian simplicity at its best. A wonderful style that I find very appealing. Well done, Su. simple CAN be beautiful. nicely done!!! Looks so pretty, the place with the books. I could have enjoyed the place just now.